Winter is certainly coming and I’m eager to crack on with the next book in the A Song of Ice and Fire series. 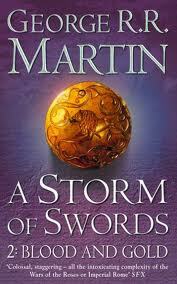 So it’s about time to write about George R. R. Martin’s A Storm of Swords Part 2: Blood and Gold. I read it back when summer was coming, so this really is late! (NOTE: If you have not finished A Game of Thrones, A Clash of Kings or A Storm of Swords Part 1: Steel and Snow, you will find some spoilers in this post). What has made Martin’s series so popular is that fact that he is not afraid to kill off main characters, or generally shock his readers. This has never been so true as in Blood and Gold. If you thought the previous books contained bloodshed, you should be prepared for much, much more in this book. Things really start getting interesting in this instalment. Throughout the series, my choice in favourite characters has been unwavering. And again, in Blood and Gold the storylines of Jon Snow, Arya and Tyrion do not disappoint. Jon Snow’s story is still the most fascinating. His time with the uncivilised wildlings beyond the Wall has made him think and feel differently, and yet he is still a proud brother of the Night Watch. Things have changed a great deal when he arrives back at the Wall. Will his brothers believe he is loyal or think him a turncloak, especially when they learn about his feelings for the wildling woman Ygritte? Jon’s character has developed steadily since the first book. His experiences have turned him into a more complex and interesting character. He has been through a lot, and has showed his courage and honesty through it all. I’m glad to see him still fighting! Things aren’t going so well for his younger half sister in the south. Steel and Snow had Arya running in circles and constantly bumping into obstacles. Blood and Gold changes all that by crossing her path with an old enemy. Will he lead her closer to her family or into deeper danger? It’s fair to say that all of the characters have a lot going on in Blood and Gold and that there are many surprises in store. The pace of this book has really picked up, with danger at every turn and an especially big cliffhanger at the end. The plot regarding the sinister Lord of Light thickens suggesting that we’ll see a lot more of that sort of magic in the coming books. And now, along with my woolly tights and gloves, I can finally grab a copy of A Feast for Crows… Winter is coming and I can’t think of anything I would rather be reading! If you’d like to celebrate the winter with your own copy of A Storm of Swords 2: Blood and Gold, click on the link below! Everyone seems to write about George R R Martin’s books sooner or later. I shall have to read one. I read some of his science fiction long ago and enjoyed it, so I shall probably like the fantasy. I just run agains the usual problem – so many books so little time. Haha, yes that is always a problem! I can understand if it’s not your thing – but I didn’t think fantasy was my thing and have been really enjoying this series!